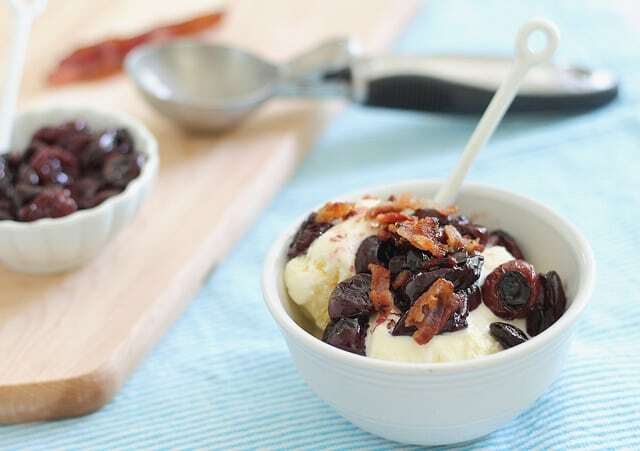 This roasted cherry bacon ice cream is an unbelievable salty & sweet combination. These three ingredients will change you. In an “omfg, I need to eat this every single day for the rest of my life” kind of way. Ok, so sometimes I exaggerate a bit. This isn’t one of those times though. Swear. First, let’s talk about these cherries which is what the actual bookmark is. I don’t know, is there even anything to say about cherries + honey + balsamic vinegar because I had no words when I saw them, just drool slowly making it’s way down my chin. How’s that for an unattractive visual? The bacon and ice cream part was my idea. We bought something like 25 pounds of meat from a local farm recently and I cannot stop eating this bacon. It’s out of this world delicious and salty with that perfect proportion of fat to meat that store bought bacon never gives you. So naturally, I’ve been adding it to everything. My stove top is in a constant state of grease splatter-age but my mouth has never been so happy. It’s a sweet and salty lovechild of epic proportions. And I don’t even like kids. 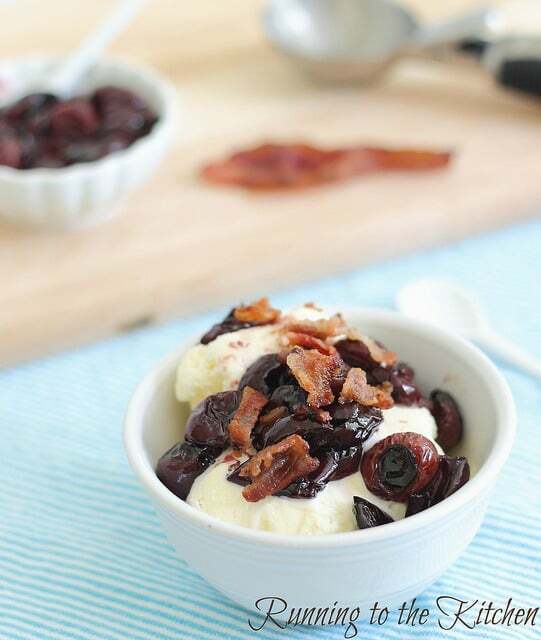 balsamic cherries = two of my fave flavors/items in one. I’ll say it again, love how you MAKE things you see. I hope you keep this series (and your mo-jo!) going! holy. toledo. those cherries look TO. DIE. FOR. & adding bacon and ice cream… yes please. 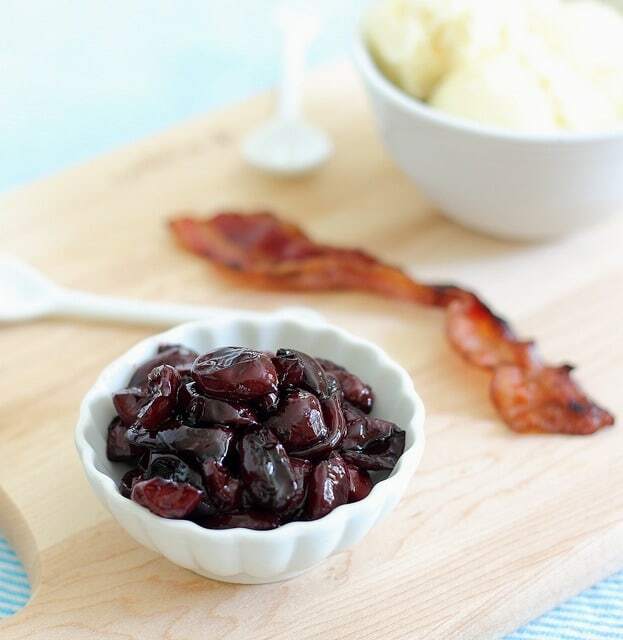 Cherry, bacon and ice cream? Ummm, yes please!!! Dam that sounds good!! Have to check out the recipe. Have a great weekend!! Gah! I’m so glad you liked the cherries! But the ice cream? Ohmigosh. Now the drool is rolling down MY chin! As for pitting cherries… it’s a pain. Or it WAS a pain. Once I figured out that you could make a cherry pitter with a FORK, we’ve been going through pound after pound of cherries. Cherries in clafoutis. Cherries in salad. Cherry mojitos. Cherries in quinoa. Cherries in ice cream. Cherries in smoothies. So delish! i LOVE the sweet & savory combination especiallyyyyyy when it involves bacon! I’ve never had balsamic & cherries before, can’t wait to give it a go. I never would have thought of this combination, but I love it here! 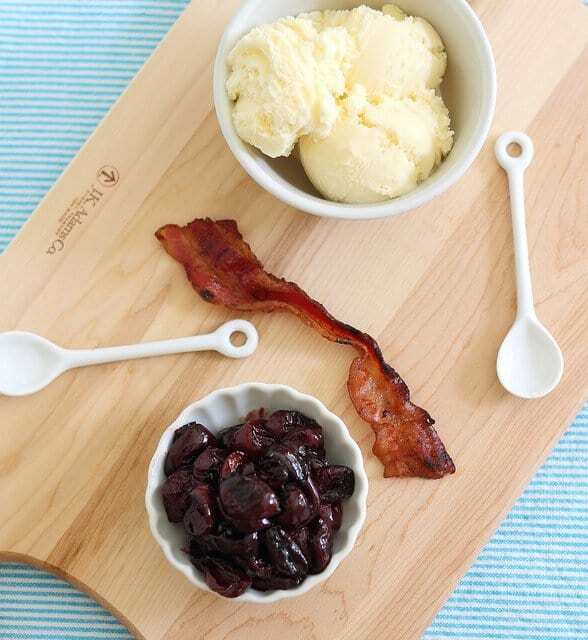 I’ve never done bacon in ice cream before, but am definitely all over this idea.